If you are a woman who loves the outdoors, spends hours in the garden (or wishes she had time to do that) and loves making new friends, it’s time to check out the She Shed Living Group on Facebook. 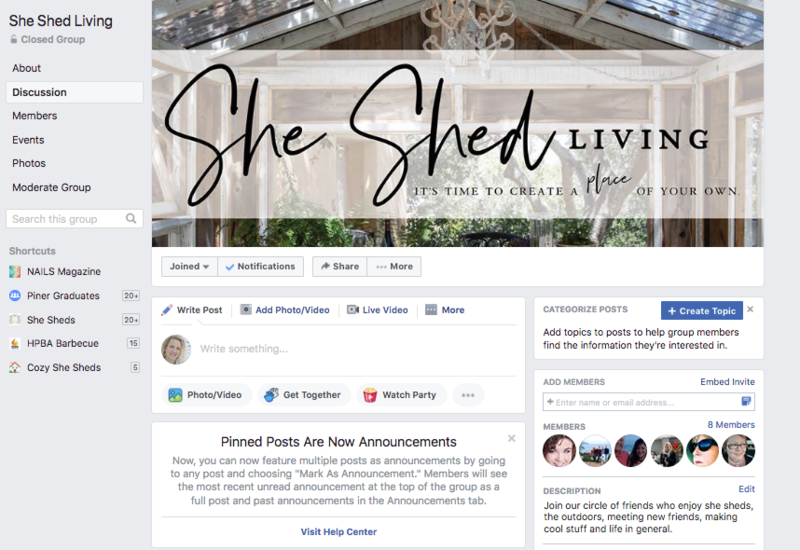 She Shed Living is where you can brag about your own backyard sanctuary (be it shed or otherwise), drool over the places your fellow members have, and swapping advice and ideas. We have big plans for this group including giveaways, contests and special charter discounts on our paints and other merchandise. Special events will be offered in Southern California (location TBA, we’re currently fixing it up!) and book club networks. Requirements: Must love she sheds, socializing, gently bragging, connecting, sharing and learning. Wine love is optional. Simply go to our Group, request entry and answer a few simple questions. We look forward to hearing your knock on the door!